Become a partner of Tabcat and increase your commissions. It’s free to register – simply click here – and join our Web Gains affiliate programme today. Several creatives are available for use. Please note that new publishers will need to apply and go through the process of becoming a Webgains affiliate. Affiliates will need to click on the ‘Sign Up’ button on the top right of the page to start with the application. 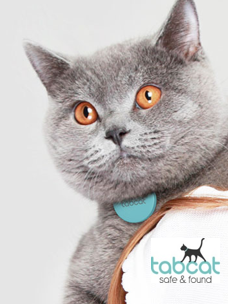 Using Tabcat, customers can easily find and protect their cat. A small lightweight tag is tied to the cat’s collar and when the cat goes missing they can follow audio and visual cues to find their cat. At only 6 grams the tracking tag is small enough for a cat to wear comfortably, unlike much heavier GPS trackers. It is also far more accurate, locating a cat to within 2.5cm and the closer one gets to the cat, the louder the beep. There is also no ongoing cost. Over 10,000 of these devices have already been sold worldwide and with your help we can sell even more together. Join our Web Gains affiliate programme today.